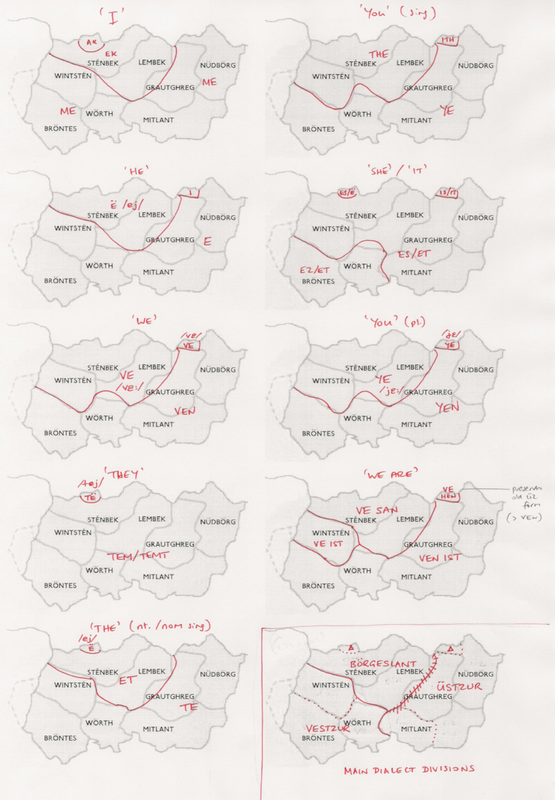 Expanded documentation of Jameld is currently under preparation, including information about dialects. To that end, the following isogloss maps have been prepared. They are, of course, at this stage merely drafts. Please forgive their quick-and-dirty nature and the fact that I have not been consistent in my use of slashes and square brackets. In due course I will polish all this stuff up for inclusion in the grand dictionary/grammar/encyclopaedia project. Üstzur - The main literary and official dialect, spoken in the area in and around the capital Wissembörg and the town of Sülz. West Mitlant has a transitional dialect, with some features of Vestzur. The northern village of Élibek has an unusual variant of Üstzur, with some archaic and divergent features. Vestzur - A progressive dialect, spoken in the south-west, showing signs of nearby French influence, particularly in pronunciation. There is some grammatical simplification in colloquial Vestzur (details to follow). Wintstén has a transitional dialect, with some features of Börgeslant. Börgeslant - A conservative dialect, spoken in the north and north-west (a more secluded and mountain-bordered area), retaining some vestigial features of Old Jameld grammar such as verb conjugations and grammatical gender plus the use of words which would be considered archaic in Üstzur speech. 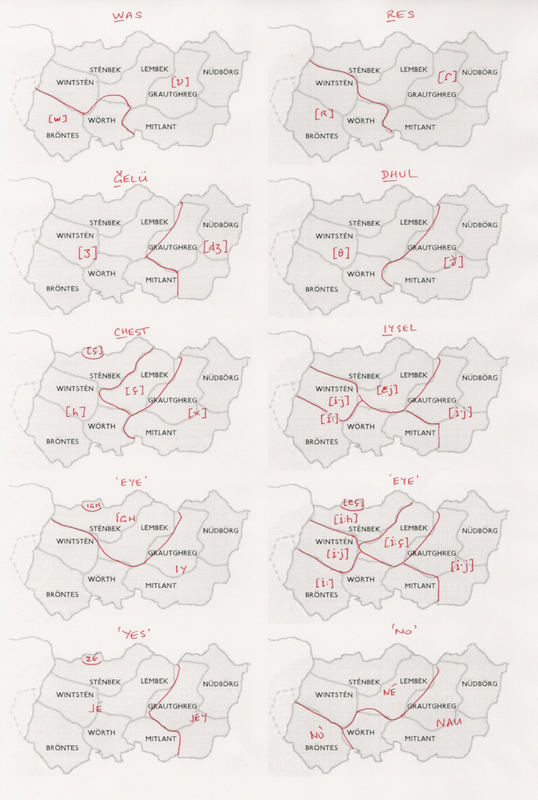 A distinctive accent with markedly different vowel values, to which the maps below only occasionally hint. The remote northern village of Wenjelsbek has an unusual variant, with some divergent features. Bear in mind that these are real places in northern Alsace upon which I have imagined an alternative reality. In the real world, just about every village has (or had) its own dialect of Alsatian German. 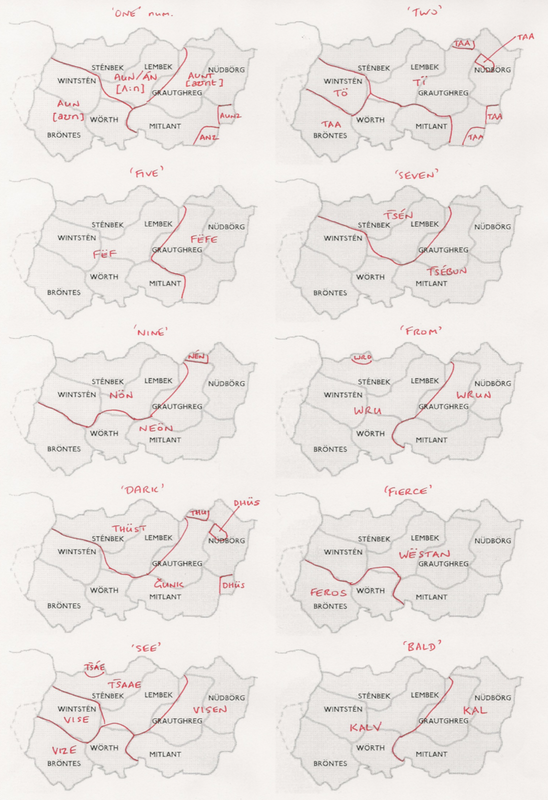 The lines and placenames on the maps refer to princings (administrative districts that include from 3 to 10 villages or small towns), and the borders follow in many cases natural boundaries, mainly chains of forested hills.